Caretaker manager Eddie May was unable to shed any more light on the current managerial position at Hibs after the Easter Road men came from a goal down to register a 3-1 win at St Mirren. Following a turbulent 48 hours in where manager Neil Lennon was suspended, Hibs deservedly found themselves a goal down after Simeone Jackson had fired the Premiership’s bottom club into a first-half lead. 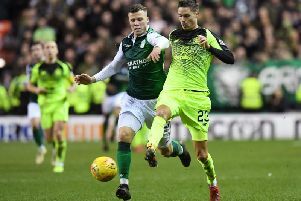 However, the Capital side rallied after the interval and goals from substitute Oli Shaw, Darren McGregor and Stevie Mallan ensured Hibs picked up just their third win from their last 15 Premiership outings. The victory moves them above Livingston into seventh in the table, five points adrift of sixth-placed St Johnstone. Florian Kamberi – who played the entire 90 minutes at the Simple Digital Arena – has been at the centre of controversy following the suspension of manager Lennon on Friday evening, where after another fiery exchange between the Northern Irishman and his first-team squad at Hibs’ East Mains training ground, the 23-year-old frontman was ready to quit the club after gathering his belongings from his locker. Chief executive Leeann Dempster was forced to intervene that led to the suspension of the former Celtic and Bolton Wanderers manager. His assistant Garry Parker was also absent in Paisley. "I do not know what is happening Neil and the club so there’s nothing I can say," May said afterwards. "I just had to prepare the team to try and win a game of football but it’s different when you’re the one who has to pick a team. "Hopefully not long to be honest with you. I have had one stint at it and I’ve always said I would never do it again. We’re all employees of the club so we just have to do the best we can. They’ve asked me to take the team until something happens. It’s good that we had a game because it takes people’s minds off things. "I have just been asked along with Grant Murray to take the team because of the situation. It’s not for me to comment and we’ll keep our distance and be respectful towards Neil and the club to make their decision, whatever that is." On the match itself, May added: "I think the players showed a lot of quality and character. We were far better in the second half than the first. All credit to St Mirren who deserved to be 1-0 up but we improved a lot after the break."